Home made, Locally Produced Pork. Let your imagination run wild! 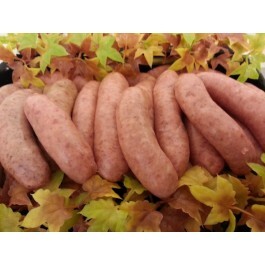 We will make any sausage that you can think of! Any Meat, Pork, Beef, Lamb etc And any 1 or 2 ingredients added to your taste. Due to the unusual nature of these sausages, minimum order must be 2kg, as this is the smallest batch of sausages that we can produce. They will however be bagged into bags of 12 and ready to freeze. Approx 48 sausages.